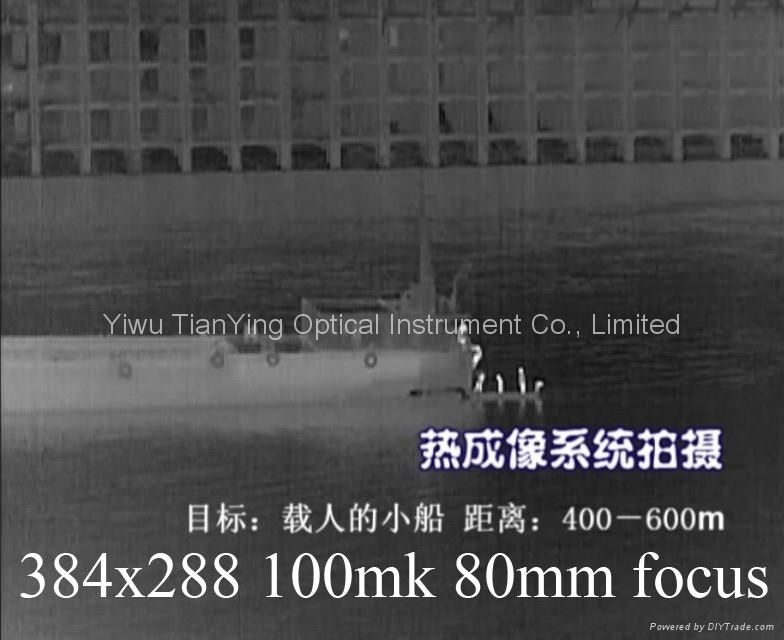 China TianYing TY-S4 thermal imaging camera system deliver auto tracking fighter beyond 12km, auto tracking helicopter beyond 8km and measurement target moving data. TY-S4 thermal camera system offer precise information and clear view, which is why TianYing Optical seeks to offer the most reliable surveillance solution. It is a fully stabilized, compactly designed surveillance system which bundles various state-of-the-art sensors. Thus, offering the user a large variety of functions comprised in only one device. The TY-S4 thermal camera system is installed in platforms on land vehicles, ships or tower. it is available as a stand-alone unit or can be fully integrated into CMS systems. 1. Stable 360 degrees continuous turn gimble and max slew rotation speed 100 degrees per second. 2, The stabilization accuracy: < 0.5mard , normal delivery 200μradian (RMS). 3. The latest Uncooled 40mk 640x512 Infrared Thermal Imaging camera with F1 big lens. 5. 5Hz/12.5Hz 12km laser rangefinder. 6. Day night detect fighter beyond 14km and auto tracking beyond 12km, detect helicopter beyond 10km and auto tracking beyond 8km. 8. Less than 73 cubic decimeter in size. 9. Less than 50kg in total weight. 10. Working temperature: -40°C to + 60°C.